Did you know that EDI Invoices get paid faster? Electronic Data Interchange (EDI) is a powerful tool that enables fast and accurate data transfer for your invoices electronically in computer readable form. It means the invoices sent as EDI can be directly read by and processed on the other end that is the computer system on the receiving end. EDI increases your efficiency, reduces the administrative burden and the end result is that you get paid faster because the entire process is undertaken by computer systems at both ends. Currently, when traditional invoices are sent out (other than the chance of your invoice getting lost or left on the boxes) your invoice will be manually entered, sent, queued and paid, although this process will take days. GoFar EDI ensures that the communication between you and your customer is accurate and with regular updates to the status of your invoice, you will the status readily at anytime. This automated system frees up human resources, reduces the chance of inaccurate data entry and therefore it offers a more efficient manner in which to conduct business. 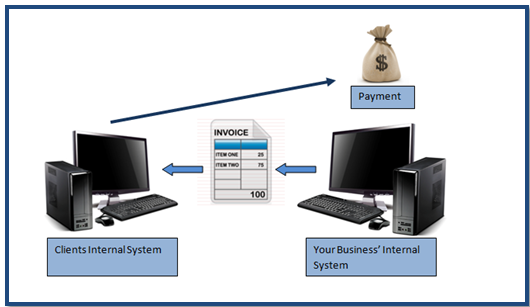 What do you need to gain efficiency in invoicing? Get GoFar and the rest will follow. GoFar EDI can take your invoice created by your accounting software, convert it into EDI Format and transmit it to the final destination. GoFar EDI has a user friendly interface making your life easier and freeing up more of your time to devote to making your business more successful.